ePublishing Knowledge BaseePublishing Knowledge BaseePublishing Knowledge Base Common QuestionsHow does the content recommendation engine work, and how do I adjust the factors that drive it? If your site makes use of the content recommendation engine, this article outlines how it works. Not sure if your site uses a content recommendation engine? Do you have an element on either your homepage or your website's right or left rails that is titled "Recommended" or "You should read ..."? If you aren't sure, talk to your Solutions Manager. Here's an example from an ePublishing client. To see recommendations, you must have an account on the website. At its simplest: The content recommendation engine surfaces unread content to logged in users based on the reading patterns of similar visitors who match predefined shared characteristics. Has the logged-in user already read the article? If so, he won't be offered the article as a suggestion. Are there one or more matching user demographic points for users based on their selections made when they registered or updated their account profiles? See the example below featuring Derek and Elise for more details on this. Other factors: How many users you have on the system, how active they are once they are logged-in, and whether they fill in the user demographic fields on the Registration form / Account Profile form. 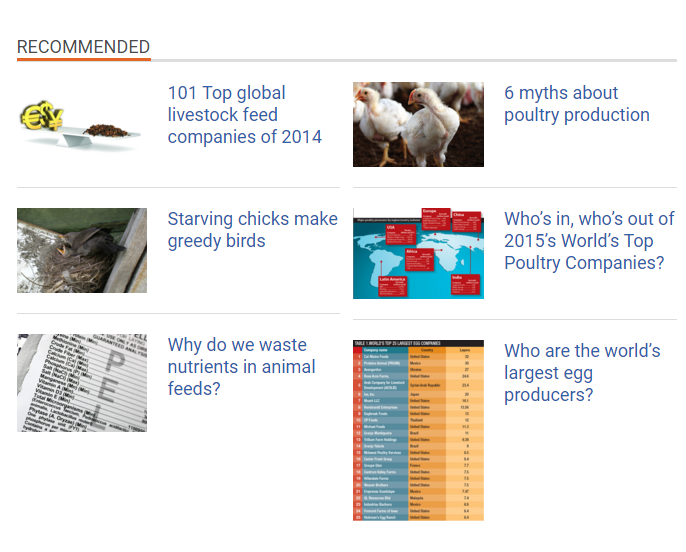 These all factor into the relevancy of the content recommendation engine's offerings. Clearly the more logged-in users, the more traffic, and the more pageviews, the more useful the results will be. Derek, who identified as a CFO. His industry is regional banking. Elise, who identified as a CFO. Her industry is insurance. Both Derek and Elise are active users of the site. Elise logs-in on Monday and reads six articles. Derek logs-in on Tuesday. His You might be interested in ... section of the homepage or in his right rail shows three of the articles Elise read the day before. Derek reads those three articles. When he returns to the site on Wednesday and looks at the You might be interested in ... area, those three articles will no longer be shown. But he will see other articles that Elise, the CFO, has read. Or he will see articles other users read that are in his industry of regional banking. If there are other users who share Derek's job title and industry, their reading habits will be offered as recommendations first. 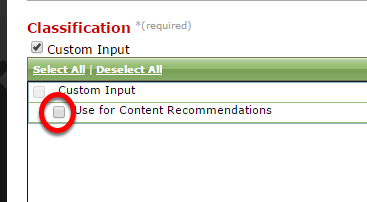 Select the "Use for content recommendations" taxonomy (1) and then the "Get associated master details" (2). The resulting list includes the custom user demographic questions that drive the content recommendations. And now you may be realizing you either only have one type of user data driving recommendations, or you want to change what is being used. Zoom: The resulting list includes the custom user demographic questions that drive the content recommendations. To change or update the data used for content recommendations, assuming you have permissions, go to the SysAdmin menu bar and select User Demographics > List / Edit. 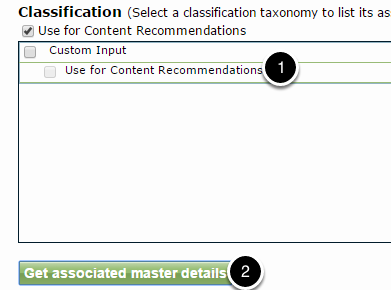 Select the Custom Input (or parent of "Use for content recommendations") taxonomy (1) and then the "Get associated master details" (2). The resulting list are those custom user demographic questions that you could add to the content recommendations. Click the name of one you know isn't already associated with the content recommendations. Zoom: Click the name of one you know isn't already associated with the content recommendations. Scroll down to the Classification taxonomy and click the checkbox next to the "Use for content recommendations" taxonomy. Click SAVE. You may have to wait at least 15 minutes to start seeing recommendations populate based on your new selections. 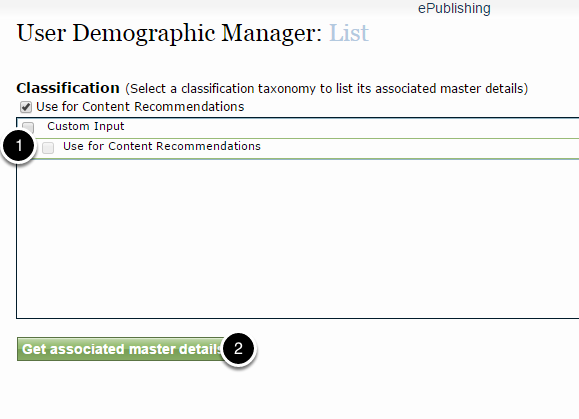 In the User Demographic Manager, select "Use for content recommendation" and click "Get associated master details." The resulting list includes the custom user demographic questions that are driving the content recommendations. Click the name of the one you want to remove. Zoom: The resulting list includes the custom user demographic questions that are driving the content recommendations. Click the name of the one you want to remove. 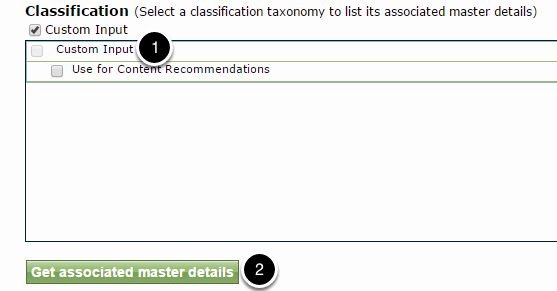 Scroll down to the Classification taxonomy and de-select the "Use for content recommendations" taxonomy. You may have to wait at least 15 minutes to start seeing recommendations populate based on your new selections. Prev: Why can't I add a file to the Media Manager? I've been able to in the past. Next: My site isn't updating as quickly as I think it should when I add new content. Why?